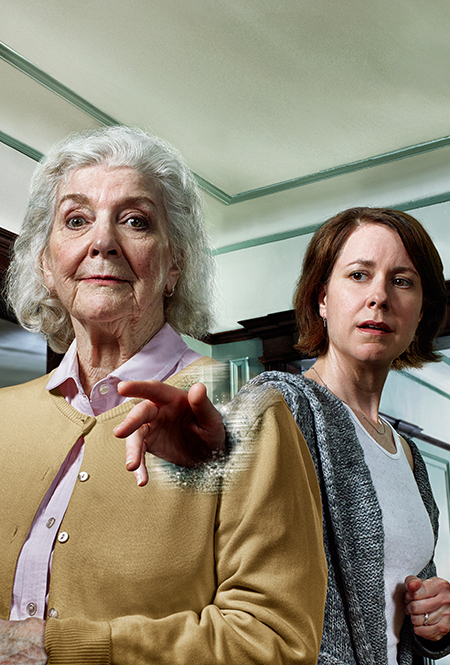 Writers Theatre presents MARJORIE PRIME. I saw this show yesterday. I can’t stop thinking about it. Harrison’s play is a series of stories told by different people from different memories. It’s almost like the childhood game telephone. The information relay is tainted with emotion, time and perspective. Thebus’ health and memory are failing. Her prime gets input from her dwindling faculties but also her son-in-law’s memories of stories. Harrison’s premise is evocative. Putting together the complexities of the past and the present is engaging. I want to be vague about the overall story because the brilliance of the experience is putting together this puzzle to understand who these people are and what kind of life they have and had. Director Kimberly Senior masterfully directs this superb ensemble. The outstanding Thebus and Kate Fry (Tess) transform onstage without their life’s burden. They are almost unrecognizable as they change over time. There are powerful scenes at the end between them and Hellman. The trio are sharing family stories without regret or resentment. It’s an unforgettable and surreal. Nod out to the steadfast Nathan Hosner (Jon) who plays the perfect son-in-law and husband. MARJORIE PRIME is about death, dying and the lingering leftover life stories. This show is sold out for the majority of the extended run. I highly recommend purchasing a ticket ASAP!